Blood pressure measures the level of blood pressure in the arteries. The first value, called systolic pressure, records blood pressure when blood is evacuated from the heart. At the moment when the heart relaxes, there is a remaining pressure given by the arterial tonus – which is called diastolic pressure. The normal level of blood pressure is of approximately 120mmHg (systolic) and 80mmHg (diastolic). Those values may vary with age, but they also depend on your general status or on your physical exercise. If you have been told that your blood pressure is higher than 140 and 90, you should ask for the advice of your family doctor. How do you know if your blood pressure is too high? The only way of finding out whether your blood pressure is high resides in measuring it – blood pressure varies depending on the age and on how physically active you have been before the measurement is taken. At the same time, if you are nervous or anxious, the result can be higher than normal. A high value does not necessary mean that you are having problems with your blood pressure – your physician should check your blood pressure several times before deciding if its level is higher than the normal admitted limit for your age. A person with a high blood pressure feels well, looks well and rarely has any symptoms. However, high blood pressure makes both the heart and the arteries to work too hard, which, in time, can cause issues with them, determining complications and, sometimes, even the decease of the patient. In order to prevent such consequences, the physician can recommend you to make a few changes in your lifestyle, namely: give up smoking, regularly make physical exercise and adopt a balanced diet. 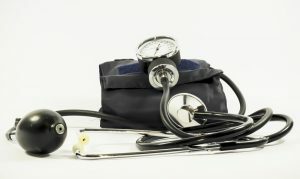 Such recommendations can be enough to maintain blood pressure at a reasonable level, but there also is a possibility for some people to need to take drugs – the number and type of drugs varies from one person to another and depends on the way in which the blood pressure level reacts to treatment. If you have been given high blood pressure medication, you will have to take it for the rest of your life – only this way, the risk of a stroke or of a myocardial infarction can be drastically reduced. The medication lowering blood pressure actually prevents the early ageing of the heart and blood vessels. Most of the time we are not able to find a cause for hypertension – a series of factors contribute to the increase in blood pressure, and hypertension has a tendency of being inherited from one generation to another. Only in approximately 5% of the cases there is a reason – most of the time, concerning the inadequate functioning of the kidneys. On the other hand, the extra weight, the high alcohol consumption, the excess of sodium (from salt) and a diet poor in fruit and vegetables can lead to an increase in your blood pressure. What can you do to reduce blood pressure? A healthy lifestyle can help you maintain your blood pressure at a low level. That is very important, if you have been told to have hypertension. This is why it is indicated to maintain your weight at a level which is appropriate for your height and constitution. Eat more fruit and vegetables and reduce the amount of salt from your daily diet. Salt sodium is associated with high blood pressure. Sea salt, iodized salt, they all contain sodium and have the same effect on your health as the salt from cooked meals. To ensure that your blood pressure remains at a healthy level, reduce the amount of salt that you add during meals and eat less fast-food products. Include in your daily diet more fresh vegetables, fruit and whole meal cereal. Small quantities of alcohol can provide a certain protection against heart diseases, while large quantities of alcohol can increase your blood pressure (beside harming the liver and the heart). For men – 14 standard doses in a week. For women – 7 standard doses in a week. What does a standard dose (10 grams of alcohol) mean? A small glass (50ml) of spirits (whisky, vodka or gin).